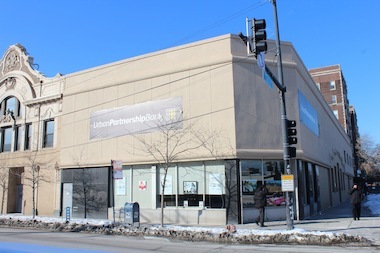 Urban Partnership Bank closed its South Shore location in March 2014. SOUTH SHORE — A new movie theater and bowling alley may be coming soon to the former Urban Partnership Bank building in South Shore. At a 5th Ward meeting Tuesday at the South Shore Cultural Center, Starks presented a rough idea for the 46,000-square-foot bank that included a four-screen movie theater on the main floor, a six-lane bowling alley in the basement and a kid-friendly restaurant and play area on the second floor. “It’s designed to be a boutique theater, think Hyde Park’s Harper Theater,” said Starks, who said she was alerted to the bank’s potential by one of her South Shore neighbors. Alisa Starks is taking on redeveloping the former Urban Partnership Bank in South Shore. She said the first floor would also include a Cajun restaurant called Odessa with live jazz and blues run by the chef from the now-closed Epiphany Bistro in Lincoln Park. Starks said she’s talking with Kangarooz Family Fun Centers about opening one of its kid-friendly restaurants with play areas full of inflatable slides and bounce houses. The current plans also call for two small retail spaces on the 71st Street side of the building. Starks said she is shooting for a summer 2017 opening and estimated the basic build out would cost $3 million. Starks said she’s committed to hiring locally and using as many minority- and women-owned businesses on the project as possible. 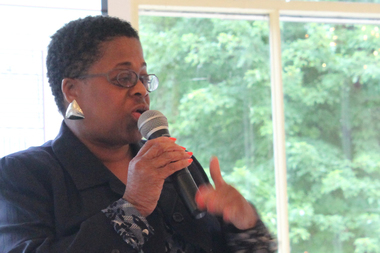 Starks said she wanted the project to be an anchor for the community and provide a destination for dining and entertainment within walking distance for many in the neighborhood. The project was roundly supported by residents at the 5th Ward meeting, many saying it was the type of plan they had asked the developers to bring to the community. Tom Brashler of Monroe Investments said the firm supports Starks' plan and was familiar with her track record when it developed a shopping center next to her ICE Chatham 14 Theater, which Starks sold in 2012 and has since been renamed Studio Movie Grill. Monroe Investments quickly snapped up the former bank three months after Urban Partnership Bank announced it was leaving the neighborhood. But the firm has been slow to redevelop the bank’s three properties. Plans for a McDonald’s on the bank’s former parking lot are on hold after concerns by neighbors, according to Brashler. When asked about plans for the bank’s drive-through, Bashler said there are “absolutely none” at this point.